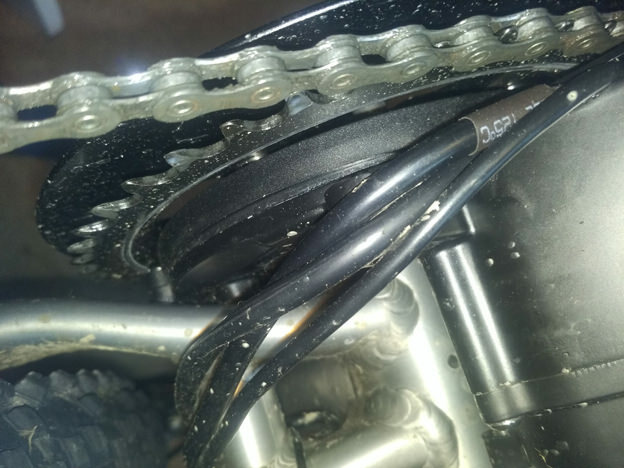 It looks like the plastic cover over the big gear may not be seated properly, you would need to remove the chainring to seat it properly. Thanks, wonder why that happened. Will have a look when I get a chance. Does anyone else have a slight gap underneath their motor near the chainring? Just wondering if I'm putting some kind of undue strain on the motor chassis to cause this? Or a trained wild pig down there in NZ I have considered that quite a bit, a trained wild pig with armored back protector, helmet, googles, (and his own tusks!) riding on the back of a supermoto motorcycle and squealing at cars to get out of his way. Just wanted to say thanks to recycles-ebike.com for a such a speedy delivery! Very nice! Do you have a link to purchase the bell lights? So you don't need a DC-DC converter for these? USD $395 for a light!! I think it goes to the light cable. Has anyone got any recommendations for a decent front/rear light set that fits the TSDZ2? If I only have to charge 1 battery for everything I might actually remember to do it! Hmm, also didn't come with a M8 x 40 bolt to attach the fixing block - that's a bit annoying! Edit: My mistake - I found the bolt! But it does require some washers to give it a good fit. I love it when he whacks the wrench with a hammer, that's just how we do it! I laughed at that too. But... also I was unsure how to get the correct torque when using a weird tool like that bottom bracket tool as you can't use a normal torque wrench - so how do you get the correct torque? Instructions - lol. There is a website with a couple pdf's, I think Casainho has them on his website too. One pdf is for install, the other is for the display and how to get into the settings mode. I think I got mine from this website: http://www.cnebikes.com/download.html Awesome, thanks for this!